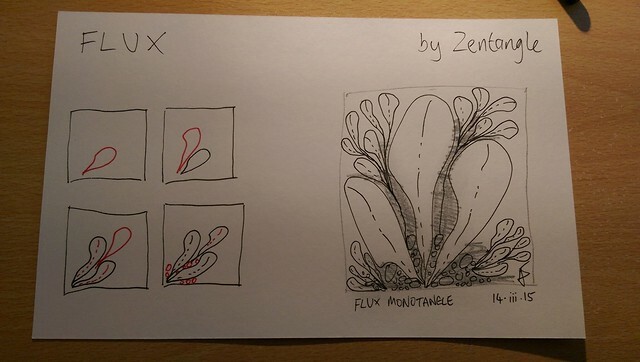 Over the last month in quiet moments I have made more cards for my index box. The children are beginning to use them and occasionally contribute cards themselves. We had a session where they tried to create a tangle, with varying degrees of success. The popularity of my club varies wildly, with a classroom full of children on, erm, lunchtimes when it rains and when it is close to freezing outside. Presumably by the summer term I will have no students at all. 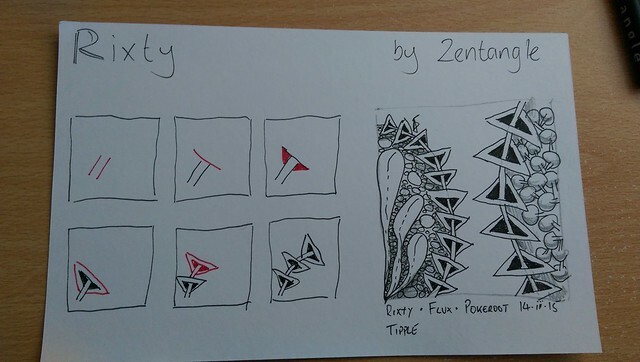 An initial thought when starting to make these cards was that when I had enough it might be interesting to scan them and turn them into a deck of cards. There are printers on the internet that can take a set of artwork and print them as 52 playing cards, with or without suits and numbers, for a small sum – the more you print, the less it costs per deck. I think one of the famous blogging CZTs sold a deck of cards in her Etsy store, but didn’t ship to the UK. 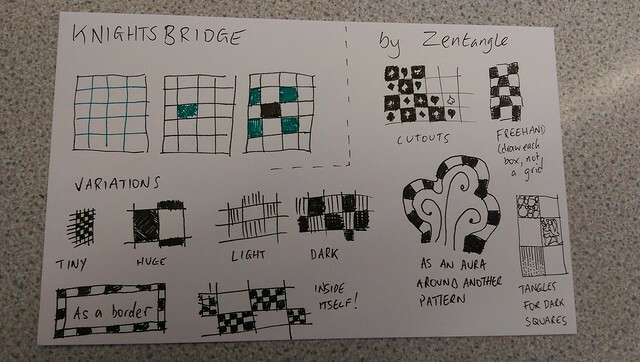 I think this would be fine for personal use but if I wanted to sell them (eg to other UK teachers interested in the idea of a Zentangle club) it would be awfully complicated from a copyright point of view. 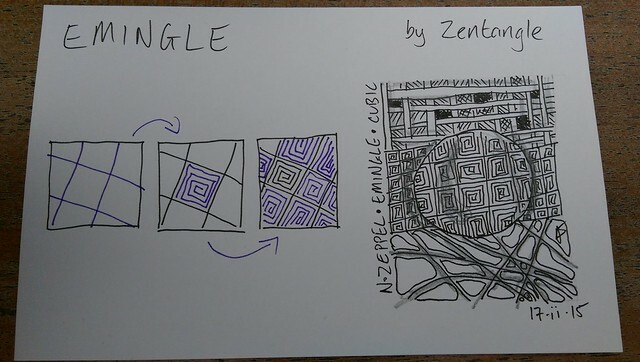 One final set of info before we progress to the tangle designs: here are some sources of information for people wanting to find out more, including the students who come to Zentangle class. 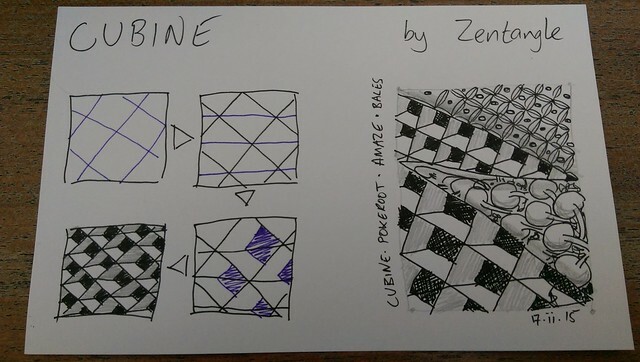 Zentangle.com – where it all began. Now you can buy equipment, sign up for the newsletter, read the blogs, and learn new tangles as soon as they are published. 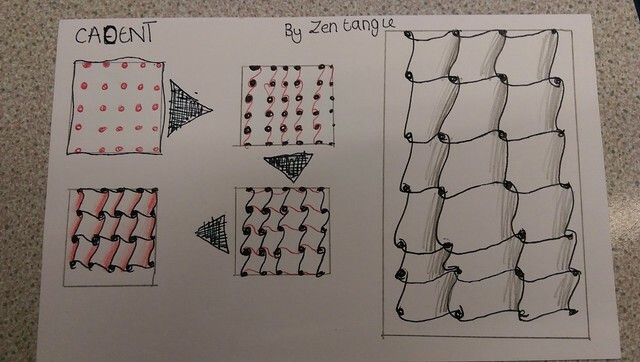 You can be inspired by the worldwide community of tanglers. Tanglepatterns.com – the most comprehensive and organised list of tangles on the internet, along with regular updates and a huge list of suggested string patterns. Well worth the couple of dollars to pay for the PDF index to all of the patterns the author knows. 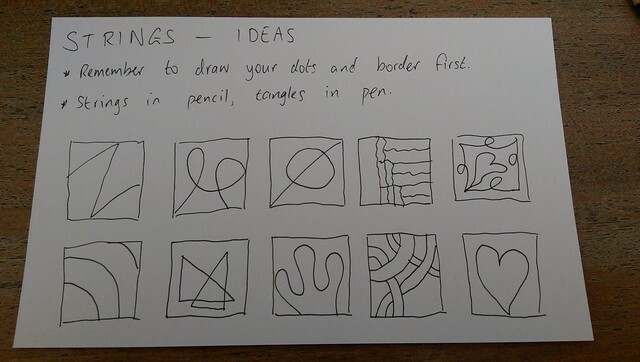 You can use this index for inspiration (eg she suggests printing on card and cutting out all the tangles and putting them into a scrabble bag) or as a reference when you have seen something and are trying to work out its name and how to draw it. Zenpopper.com – As I write, the main website is suspended. Hopefully it will be back soon. But their youtube channel is still going strong. They have a hundred or so videos showing you how to make the patterns. 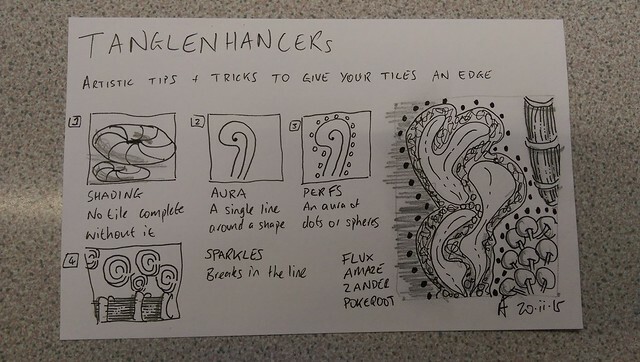 Perhaps this will make it easier for some people to understand how to make one of the tangles, rather than the step-by-step instructions? I do like the speeded up, machine drawn versions – some of the other hand drawn ones lead me to getting a bit distracted by the state of the manicure. The main website includes a random machine which produces three tangles to use today, if you are struggling to make your choice. 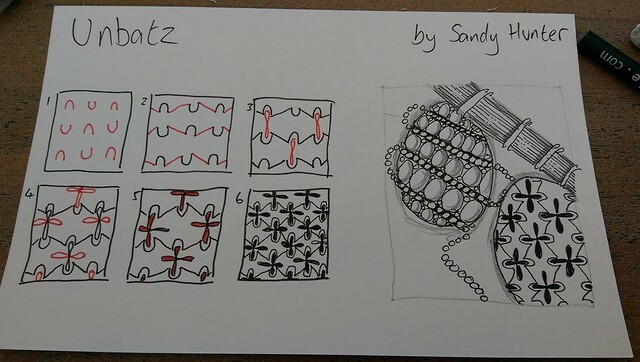 I particularly like the sort of stalagmites in their header image, and I can’t work out a name for that pattern, although I think I can see how to draw it. The Diva’s weekly challenge – The Diva is a CZT with a blog. 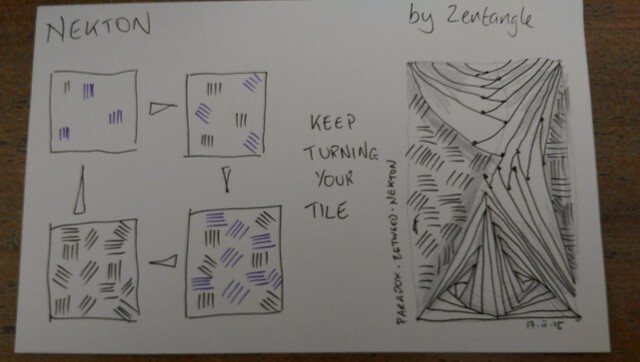 Every week, she makes a suggestion for people to use in their own tangling, and over the week, a hundred or so people draw a tile to her suggestion. Full instructions are always given, including on how to publish on the internet, and it is fascinating to see how people interpret the same thing differently. I showed the challenge to my students one week, and we all learned how to do “Unbatz” (see below); the following week they asked to see what the current week’s challenge was too. AS yet, no-one has completed a tile within the week that can be shared.